The project we worked on with level four in term one was to create a radio play. We initially looked at the Orson Wells version of War of the Worlds. This leads into interesting discussion on the use of sound effects to crate realism as well as talking about radio plays and how they work etc. why they were and still are very entertaining and acting and script writing techniques that create a sense of reality.We also discussed the genre of Science fiction – which can simply be defined as stories about a science or technology that doesn’t exist and the subsequent consequences of if it did exist. Here you can discuss the impact of adding music to a story, does it add to the story or overwhelm it. From here the project fell into a number of steps. 1. write and practice your own science fiction radio play. 2. record it. This can be done in garage band. I tend to use the podcast template because it allows simplicity. It has a male and female voice preset that the kids can record straight onto. Just highlight the track you want to record onto and push the record button. 3. add sound effects. Garageband has alot of great samples which can be accessed on the right hand side of the project window, they are labelled under the category of stingers. you can also use the jingles samples to add authenticity to your radio play, eg if you want to cut to an add etc. Sound effects can also be recorded in in the same method that you used to record your voice. This is always an exciting and slightly more authentic way to enhance the students projects. 4. Add a soundtrack. This is always an interesting part of the project and often it is advisable to discuss the role of music in soundtracks. It is used to enhance the main format which in this case is the narrative that is being delivered by the voice. It is being used to enhance the desired emotional state and if it is doing anything else it is being counterproductive to the project. Placing limitations at this stage of the compositional process is a useful thing for many students. The variety of choice that programs like garage band offers can become overwhelming for many beginner composers and quite often leads to boredom. 5. 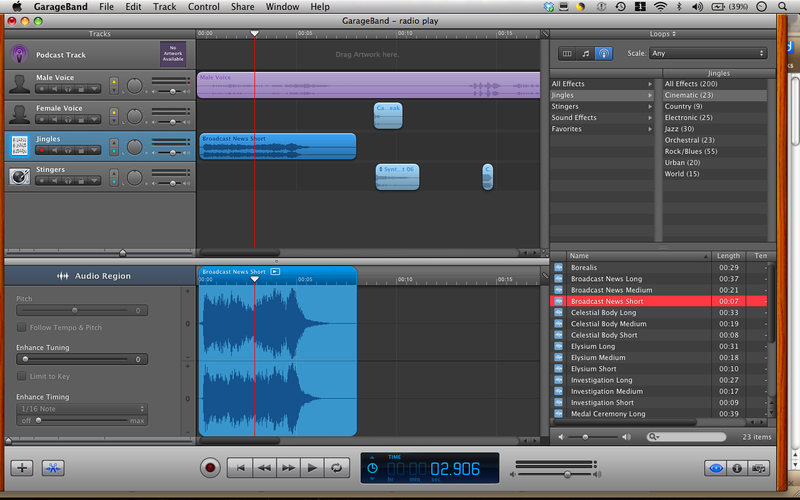 Finally render the project down into an mp3 format and upload it to your blogs. Use of ICT equipment – microphones, mixing desk, etc. This entry was posted in creativity, General Teaching, ICT in Education, Music Education, Uncategorized and tagged garageband, kynan robinson, radio plays by kynanrobinson. Bookmark the permalink.